Producers: Ultra Super Pictures, MAGES. Lost Song is by no means a revolutionary anime that's going to change the game forever. That doesn't mean that it isn't still unique and surprisingly enjoyable. In fact, I would say it's that surprise itself that lends a hand to my enjoyment of the series overall. 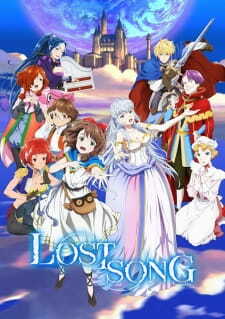 I went into Lost Song with low expectations, given from the first few episodes it seems to be a standard fantasy era war show without any interesting gimmick that made it stand out. Only reason I kept with it was because I watched with a friend and we wanted to predict what would happen. Predicting what will happen in Lost Song is a feat that proves much more difficult than you would expect. As I said, it was the surprise of how much we couldn't predict what would happen that made it so enjoyable. Partway through, the series pulls off one of the best plot twists I've encountered for such an unassuming series, and it's how discreetly packaged this show is that made it such a wonderful, delightful surprise. That isn't to say it's only the surprise that makes it interesting. You find that groundwork had been laid out this entire time, and unbeknownst to you, a well crafted and clever series had appeared beneath your feet before you knew what you were watching. All I can say is to give Lost Song a chance, and it certainly won't disappoint you. I wish there had been just a bit more time for better pacing to give a few more characters some spotlight or unfold a few more threads they'd lead with and tied off loosely at the end, but all in all, it's still satisfying and a very fun ride until the very end! The art is decent at worst and great at best, the music is enchanting, and the two protagonists are the characters who really sell the story. Lost Song is the hidden gem of its season. When i found this anime, i looked its trailer and i was instantly captivated by it so i decided to watch it. And it was a good choice! I loved the art style and the story in this anime a lot. It was different in story wise that i usually watch but i found it enjoyable and interesting. About mid-way they put in a plot twist that was best i have seen so far and it just made me want to watch this to the end. There was little confusion in the last few episodes that could have been put a little better but still the story was clear and the ending was kinda sad but hopeful. I love this anime and i will rewatch it defo. This anime started off really good but ended really poorly. I enjoyed a lot of the characters in the story. I really liked the magic design of the world initially. The main story was extremely enjoyable for the first 60-70% of the anime. Giving this a rating was a bit hard because the story started off being extremely enjoyable. But by the end, the story telling took a really bad turn. I love music and anime as much as everyone else on this website does, so when the two come together, it makes me really excited. I actually really liked the idea of the anime; the idea that there are special people in this fantasy world that can control wind, fire, water, etc., and can cause hope and destruction as well. Though this idea isn’t entirely unique (another anime I’ve seen with characters that hold the power of song was Soredemo Sekai wa Utsukushii), it’s not seen very often, so when I get the chance TO watch an anime with a musical aspect, I want to see it. However, there were many things about this anime that I really couldn’t bring myself to enjoy. For the first seven episodes of the anime, it was really easy to follow along with the plotline. In fact, I think it was a little TOO easy. Those - what I believe the creators intended to be - little “plot twists” that occurred throughout the anime were too predictable for me. Maybe it was just my investigative mind, but whenever something dramatic was about to happen, I thought to myself, “‘this’ is going to happen” and to my surprise, it did. I like being caught off guard and not knowing what’s going to happen next, so being able to fill in the blank before it was filled in for me was a little irritating. Everything that happened after episode seven was just a huge downfall. Sure, this was when everything became less predictable, but it was because everything was so rushed and poorly put together that I couldn’t follow what was happening at all. In my opinion, I would have gone a complete different route in telling the story, you know, one that makes sense. I wish I could explain why I believe these things about everything after episode seven, but I don’t want to spoil anything. Another thing I’d like to mention that really annoyed me were those small moments of comedy. They were not funny. Having the main character scream out “THERE’S FOOD?? WHERE? WHERE’S THE FOOD??? ?” ever so often is not funny. Having another character “explain” why something isn’t scientifically correct while the other characters interrupt him with “we don’t care” is not funny. It’s childish and it’s cringy, that’s all I have to say about that. If I could describe the animation in one word, I would choose the word “amateurish”. It was as if the professional side of the animation team solely focused on animating the characters singing while the rest of the anime was left for the most inexperienced animators. There were moments where the animation felt really choppy, especially during times when the characters were walking. The character designs were hardly attractive, and the villains were downright ugly. Don’t even get me started on how some of the women’s breasts were drawn - and when I say that, I mean the character Pony in particular. There were so many times when she was on screen that I just wanted to reach through my laptop and pull up her corset because there was NO reason for that much cleavage to be hanging out. I don’t even think it’s physically possible for a woman to show that much without exposing herself. But then again, it’s anime. Breast logic doesn’t exist in that world. Before I talk about the characters of the anime, I wanted to let whoever is reading this know that I began watching this while I was cooking, so I watched dub instead of sub. Don’t watch the dub, it’s horrible. The voices for the characters are very annoying. Voice acting aside, I didn’t really find any likability or reason for a lot of the characters in this anime. Most of them were just there with zero purpose. Of course, zero purpose means zero development, which is something I also noticed in most of the characters WITH a purpose. Sure, our main characters learn new things, but they never had that “eye opening experience” that caused them to change. I noticed only two characters in the whole anime who DID have that experience, and they were Rin and Finis, our main characters. However, although Rin had that experience, it did not change her character. This was also an experience she had near the end of the anime, so by the time she realized her true purpose in the world, the anime was practically already over. Finis, on the other hand, drastically changed from her naive ways in the beginning of the anime. But it was a change for the worse, and nothing about her new character really improved until, again, the final episode. The one redeeming quality this anime seems to have is its music. The opening and ending theme songs were easy to forget, but the music within the anime is what really impressed me. I don’t usually pay attention to the instrumental soundtrack, but I’ve noticed that when an anime revolves around music, the composers do a better job with creating the music. I don’t really know how to explain it other than that I can tell it wasn’t lazy work like what’s given to us in other anime. Now what it is I really want to discuss next are the insert songs: The Song of Healing, The Song of Wind, The Song of Fire, The Song of Water, and The Song of Destruction. I really loved these songs. The voice actors did exceptionally well with putting emotion into these songs, and the harmonies that are sung in some of the different variations are very beautiful. My personal favorite song of the five is The Song of Destruction. I believe that song was the one that really made me feel the most emotion for the character that sang it. Maybe it’s because I’m getting older or what, but this anime didn’t appeal to me in the way the other “musical” anime I’ve seen have. I understand the PG-13 rating, there IS quite a bit of gore and profanity, but other than that I thought the anime to be very childish and ultimately disappointing.